« Time for a reality check NSB? My daughter is not easily fooled. She sees through all the little tricks that you can normally fool kids with. There is however one blatant lie that I have been able to get her to believe. That one thing out of all the other things I have tried to trick her with is that she believes I have an extra pair of eyes at the back of my head. I guess you do instinctively grow an extra pair of eyes when you have an active kid that demands your attention all the time. You know that if you let your watch down for just few seconds that they have managed to get themselves into some kind of trouble. It is all about survival really. Your side vision becomes super sharp if you don’t want to either bring a cage to the grocery store or spend hours trying to pick up everything you need. I am actually amazed that evolution hasn’t already grown us some extra eyes. I have at times doubted that she actually believes that I have eyes at the back of my head. All evidence however says she really does. When I one time told her to wait because when she wanted to show me something and then when I finally turned around she said “But mom, you don’t have to turn around, you have eyes at the back of your head”. I got a new gadget this Christmas from my two favorite people. A Silhouette Cameo cutting machine that can cut vinyl, fabrics, paper etc. It took me a while to get started but for my first project I decided to make a decorated hat with wool lining. 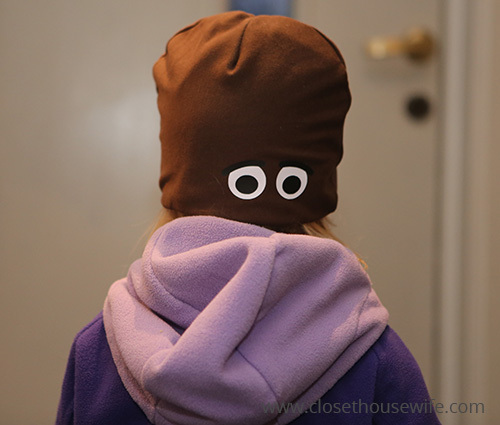 So I sewed up my first hat (based on this tutorial) and then cut out Silja’s name and a set of eyes. Now she can also have eyes at the back of her head. Maybe I should make one for her dad as well, she says he doesn’t have them ? . Hehe nice one! I will have to try this!